Traveling can be fun but if you have little ones, it can also be a long and often frustrating experience. Kids can get so bored on long road trips and without something to keep them busy, they are going to be constantly asking the dreaded, “Are we there yet?”. If you are planning a long trip, you need something to keep your little ones occupied. Luckily for you, I have just the list that you need. 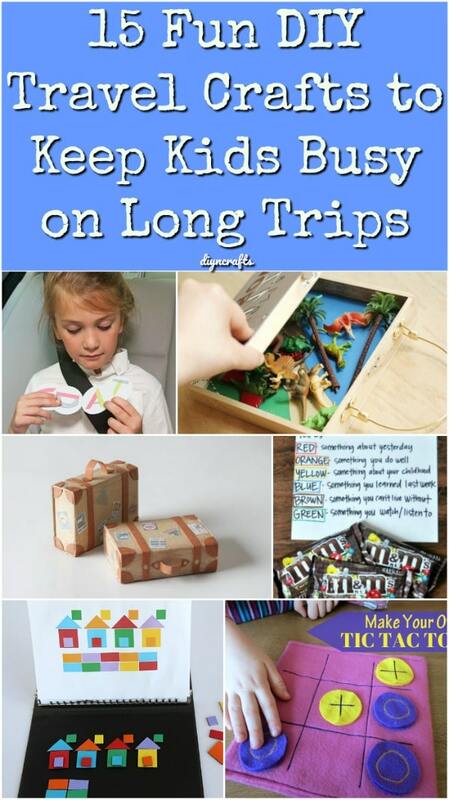 I have found 15 fun DIY travel crafts that will keep your kids occupied on those long road trips, and make traveling a bit less stressful for you. From alphabet games for toddlers to great crayon keepers and even some Lego crafts, you are going to find some wonderful ideas for keeping your kids occupied on those long trips. These DIY travel crafts are also great for planes so if you have a long flight coming up, you will definitely want to check these out. Keeping kids busy during boring times is important and it gives you a wonderful opportunity to foster some development. Speaking of development, you should give these 30 DIY sensory toys and games a look, too. There are so many wonderful travel activities in this list, from homemade travel games to travel kits that give them numerous things to do. You are going to find the perfect way to keep those little ones occupied for your entire trip. If you’re planning a vacation to a faraway destination, you definitely want to check these out. They only take a short time to make so you have time to do more than one – keep those little ones entertained for the entire trip! And, be sure that you check how to pack 100+ items into a carry on easily. 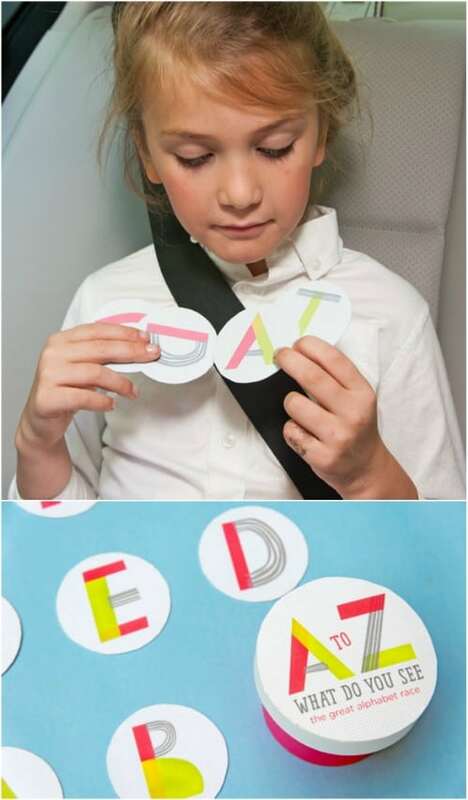 This fun DIY alphabet travel game is so easy to make and your kids are going to love it. Not only is it a great way to occupy and entertain them on long road trips, it is an excellent way to help toddlers and preschoolers to learn their ABCs. And, it doesn’t require a lot of expensive materials to make. You can make this with materials that you have in the kitchen and the craft room! Mad libs are so much fun – for kids and for adults. You can print off your own and have a little collection of them that will make those long vacation trips so much fun. You do these from your home computer and then just take them along on road trips. You can even put together a little folder of mad libs for the kids and organize them by age to make them easier for the little ones. Don’t throw out those empty coffee cans. Use them instead to make these amazing DIY travel kits. 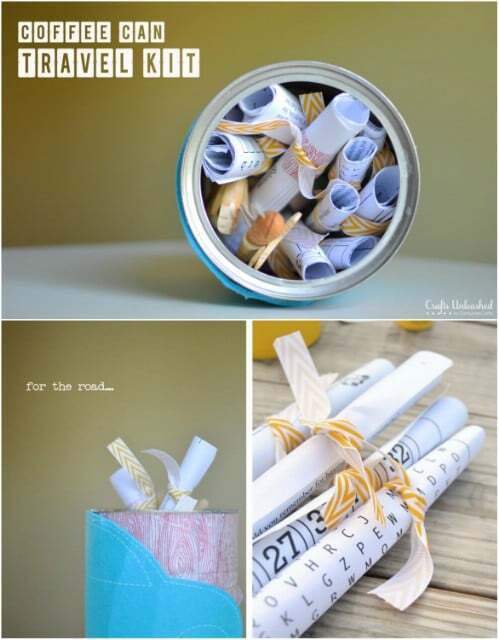 This is a great way to upcycle empty coffee cans and it gives your kids something fun to do on long road trips. You can fill these with just about anything that you want from coloring pages to printed games and even smaller toys. The kids get crafts and games to do in the car and you get some peace and quite on your trip. An old – or new – cookie sheet makes an excellent activity tray for little ones for long road trips. They can use their activity trays for coloring, crafts or to keep their snacks handy. These are so easy to make and only take a few minutes. You use Velcro to make them easy to put on and take off and they work well with car seats and arm rests in most vehicles. You can easily sew a little crayon keeper so that your little ones can take crayons along on your road trips. Just a few scrap pieces of fabric are all you need. 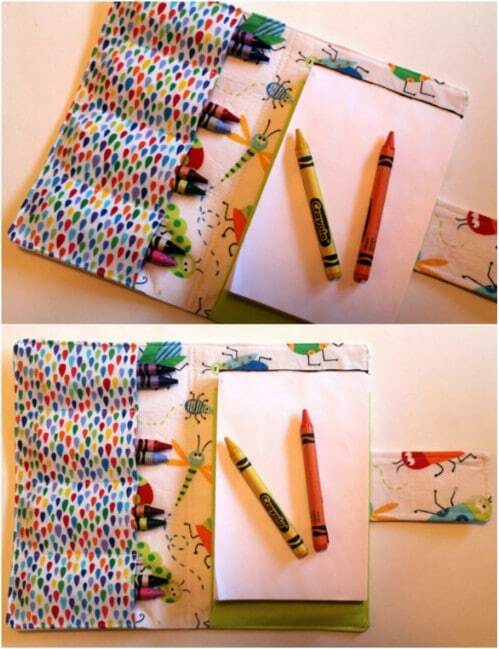 You can even make a zippered section to keep the crayons safe from falling out and put in a section to hold a small activity book. I found this one on Etsy for inspiration and it’s just $10.95, which crayon sections and a space for paper or small coloring books. 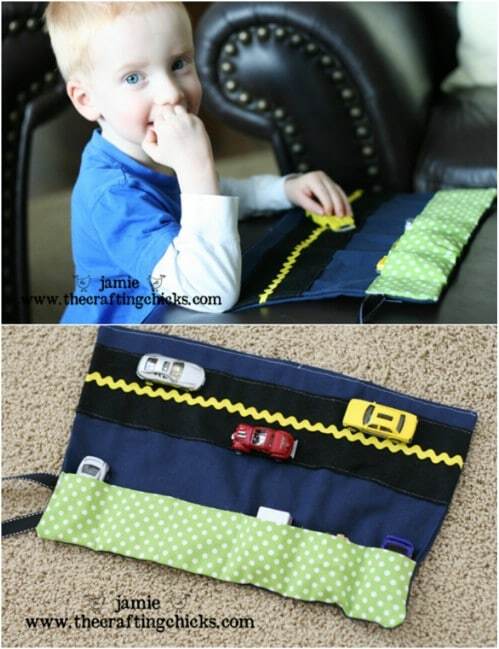 If you have little boys, or little girls, who love playing with cars, this DIY cozy car caddy is a must for long road trips. This is a really easy one to sew together and it has a space to keep their cars safe as well as a little road section for on the road play. It all folds together so it’s really easy to pack or they can keep it right there with them on the seat. Your little ones are going to love creating their own little maps of your travels. 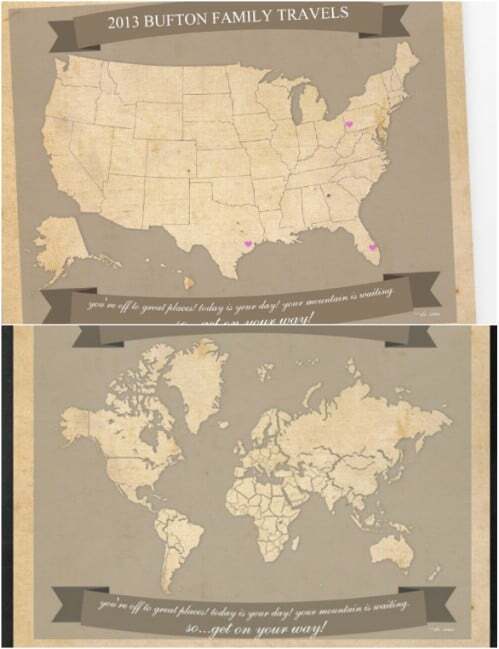 These editable maps can be printed out on your home computer and then your kids can create their own itinerary of your trip. Just have them fill in where you are going and any fun stops along the way. It’s a fun travel activity that makes for wonderful wall art when you get home. 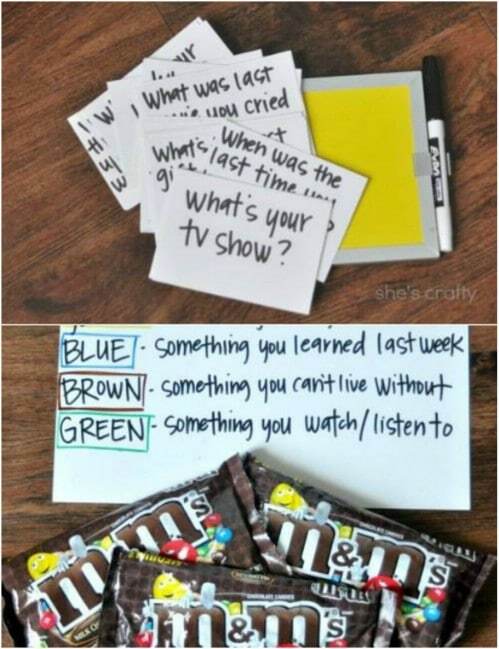 Here’s a really fun game that combines get to know you type questions with candy. Kids are going to love it! You don’t necessarily have to use M&Ms, you could use any candy that has colors. The questions are so much fun and your little ones are going to spend hours getting to know you and the rest of the family. You could customize this to answer any number of questions. 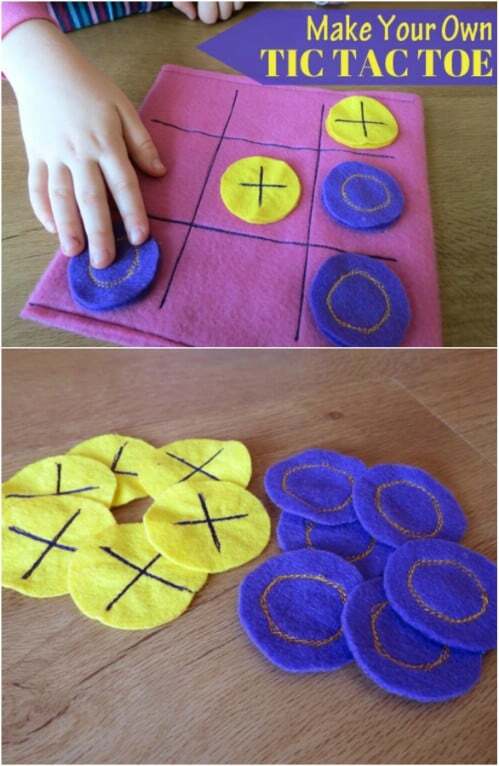 Kids really love tic tac toe and they will adore this homemade felt version of their favorite game. This is a great one for long road trips. The felt makes it so easy for little ones to play in the car and the pieces are really large so they’re perfect for tiny hands. This is a really simple one to sew together, too and won’t take you longer than an hour or so to complete. If you are planning a super long road trip, teaching your kids how to finger crochet is an excellent way to entertain them while they’re riding. 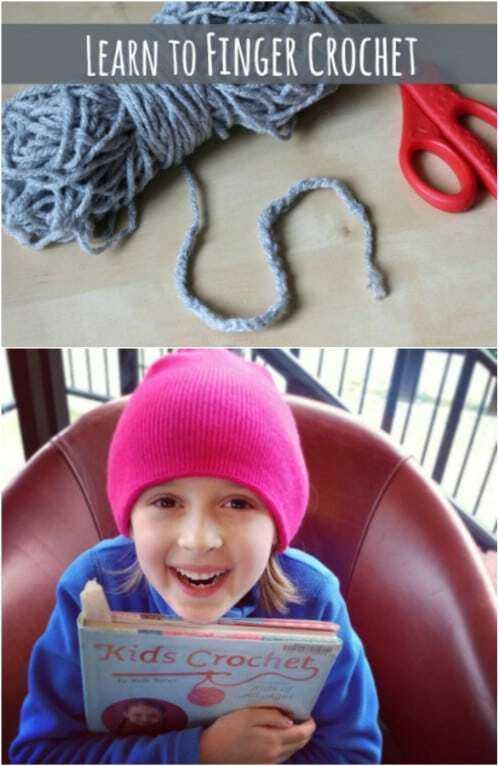 Finger crocheting is super easy even for toddlers and preschoolers and you don’t have to take anything along on the trip but some yarn. They can make any number of bracelets, headbands or other things while they’re traveling and even give them to grandma and grandpa when you arrive. I found the pattern for this amazing Lego travel case on Etsy for just $6.55. 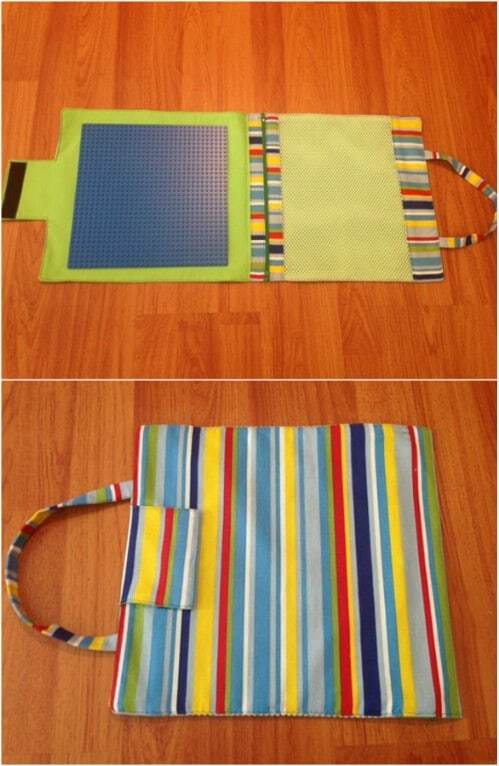 The pattern includes all of the instructions that you need to make a travel case for your kids to enjoy playing with Legos in the car. There’s a section for them to build on and the case holds those little Legos perfectly in place while you are traveling. It packs easily into a suitcase or tote bag, and takes up very little space. 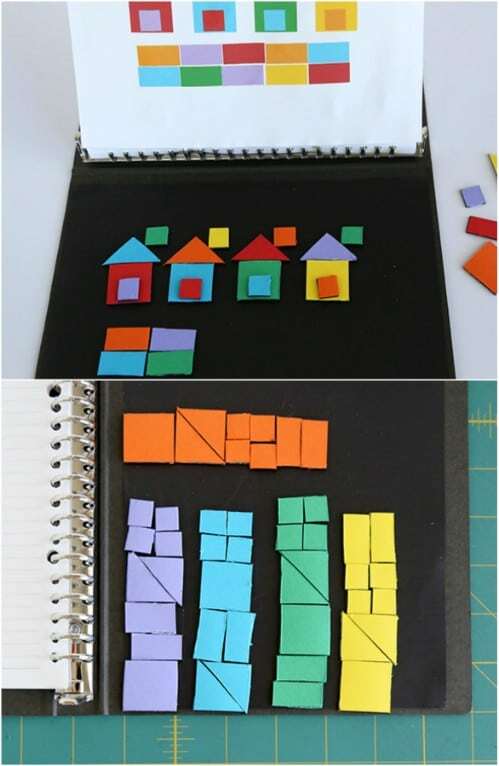 Talk about fun DIY Lego crafts! Those little magnetic travel games that you can get at the Dollar Store for a few dollars each are great for road trips, but this homemade version is even better. You can put this together in just an hour or so and your kids are going to adore playing with it. It gives them hours of fun, which makes it perfect for those super long road trips this summer. 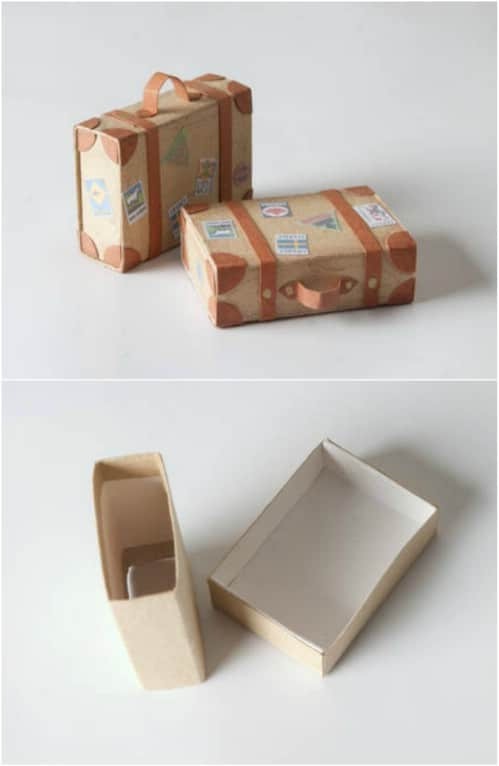 Here is a cute little travel craft that your kids can do in the car and that fits in perfectly with your family vacation. These little matchbox suitcases are really easy for kids to make and they will adore decorating them in the car. You can use stickers or crayons or markers to decorate them and there is very little work required aside from finding some empty matchboxes. A wooden cigar box and a few toys are just about all you need to make this adorable little mini travel playset. 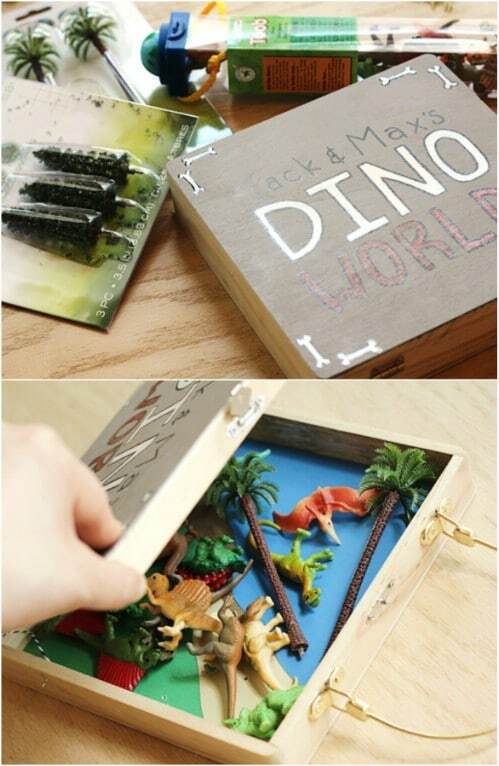 Your kids could use this for playing with any number of toys from dinosaurs to Army men and even tiny dolls. The cigar box doubles as a case for the toys so they will stay perfectly in place in the car and they’ll have hours of fun playing with this one. This DIY felt board is really easy to make and it will give your little ones hours of fun playtime in the car or on a plane. You just a file folder, a glue stick and some felt to make this one. 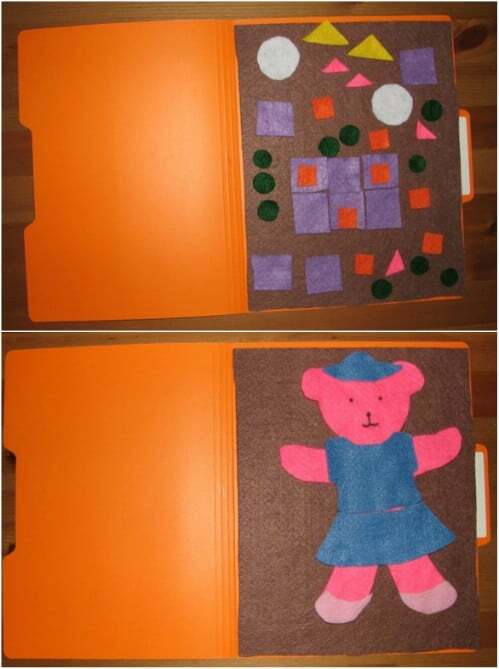 Then, just cut out felt pieces for whatever type of play they want and keep them all neatly stored inside the folder until they are ready to play. This would be great for dress up dolls or bears or cars for little boys.